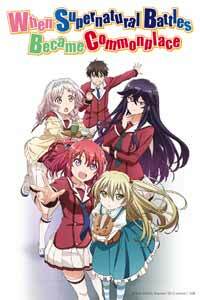 Distributor: Currently licensed by Sentai Filmworks, and also available streaming on Crunchyroll. Also Recommended: Sekirei, Love, Chunibyo & Other Delusions. Notes: Based on the light novel series by Kota Nozomi with illustrations by 029. One day, right out of the blue, the five members of Senkou High School Literature Club gain amazing supernatural powers. And what do they do with these amazing powers? So, yes... this show is basically about teenagers getting amazing powers (well, except for the guy -- his powers are useless) and then... not really putting them to use, because who cares about that stuff? And it's good. Well... mostly. Whether the whole chunibyo thing is becoming a fad or not, or has been for a while, I can't imagine how the creators of this show sold the concept of having amazing powers and keeping them in your back pocket unchecked for the majority of the series. Would you make an action movie where everyone has guns, but nobody ever uses them? When Supernatural Battles Became Commonplace's main payload is its characters, and amazingly enough, the "non-shoot gun movie" concept at play works surprisingly well because it's not the main issue. Sure, the powers are being used -- so my gun example isn't entirely accurate -- but the characters in the show basically use their powers just for fun, and for things that has no bearing and consequence in their otherwise normal life. In a sense, it's the stark opposite of the Chuunibyo TV series that was my last year's Reverse Secret Santa. Andou Jurai is kind of an idiot. He is also the only male character in the club, so when he got shafted in the big power bonanza, he... actually took it pretty well, because HIS power is cool. It's a black flame that doesn't burn, or even hurt, but damn... it looks cool. I mean... who needs full control over all the elements, or the power to stop time, or even better, the powers to alter reality any way you see fit when you can summon a dark flame in your hand?! Am I right, guys? Yet, the show keeps on kicking the legs under its audience. Andou might be a dumbass, but he's surprisingly school smart, always getting good grades on tests and the likes (to some of the other girls' chagrin) and later in the show, he unleashes some pretty good plans. Mirei spends her introduction episode uttering lines about killing, torturing or generally doing unpleasant things to Andou if he so much as thinks of wanting out of the relationship, yet when Andou is confronted about this by the other girls, they all believe his explanation and Mirai even takes the impending breakup surprisingly well. I honestly don't remember this happening in other shows of this kind. To say that the show has a main story is probably stretching it, but there is a faint thread of something in the background. The reason why our mainstays get their powers are actually explained. Some other power-receivers are all caught up in what is named "the Fairy Wars". We get some pretty brief introduction to the concept as well as more characters who are actually taking part in said war. It's not really explained to the bone, but at least you'll know why. In a sense, it's weird how what would otherwise be the most interesting part of the show actually turns around and becomes the show's biggest drag, simply because it takes our attention away from Andou and the girls. Amazing as it sounds; yes, that is a bad thing. See, the show's humor comes mostly from how grounded it all is. Otherwise, this would just be Trinity Seven all over again. Yet, two full episodes... and then some... are wasted on this. The final plot twist even revisits all this, and it's almost fascinating how quickly I wanted the show to return to the club goofing off and clashing with each other rather than these alternative dingbats that keeps me from the fun. It's especially annoying, since all the other characters with powers in the show, male and female alike, seems to settle their personalities on "smug assholes". Granted, the episodes centered around the club members aren't always the most fascinating, but any of them are still better than the posturing nonsense that is the fairy wars. In the end, When Supernatural Battles Became Commonplace is a pretty fun show. It helps that it avoids the standards of comedy when it comes to tsundere characters, idiot male leads and so forth -- kind of like when I watched Listen to me, Girls. I am your father expecting dumb comedy and finding a relatively heartfelt story about family in it as well. On the downside, we do get the standard episodes centered around things like "one of the girls are entering a light novel competition (hint, hint?)" and other issues, like jealous friends of one of the characters. On the other hand, there is a scene in the series where one of the girls finally snaps and goes on a looooong rant, and it was glorious. I do recommend When Supernatural Battles Became Commonplace. It's nice to see sensible characters in a crazy situation for a change instead of crazy characters put into a situtation that should have been sensible, and it's actually fun because of that. Still, I do have to dock it a star, simply because it doesn't take full advantage of this. Because maybe I feel that the fairy war addition was completely unnecessary. And because they don't seem to want to let that part go, provided this show gets more seasons. It's the big "but" in the ointment. Fanservice is also relatively infrequent and mild.